Oriental & Area Rugs that are found in today’s homes come in many shapes and sizes, and also vary from the materials they’re made of. Excel Fabric Care cleans rugs made of cotton, silk, wool, rayon, nylon, polyester, and a mix of all of the above fiber types. We use the latest safe cleaning solutions and techniques to restore your rug’s vibrant colors, and soft feel. Your rug(s) will not only look bright and clean, but will also feel clean as well. Inspection – First we will look over the rug for any damage, and determine what cleaning process is needed. For fine fabrics such as wool, silk, rayon, and cotton a more gentle but effect approach needs to be taken. However for rugs made of nylon and polyester we can be more aggressive as these materials are commonly found in wall to wall carpet. Removing Dry Soil – We have a number of processes to remove dry soil from your oriental or area rug. We remove as much of this soil as possible before applying any cleaning solutions, doing so ensures a better overall cleaning. Pre-Condition – We apply the proper safe cleaning solution to begin the process of breaking up the soil(s) that are embedded in the rug fibers, allowing a proper amount of dwell time to ensure maximum soil suspension. Rinsing & Drying – We will thoroughly rinse away all of the suspended soil(s) and cleaning solutions from your oriental or area rug. Our technicians then quickly dry your rug to ensure no damage is done from being wet too long. Post-Inspection – We’ll look over your rug to check to see if any additional treatments or spotting is needed. After we give the rug our ‘thumbs-up’ we’ll roll it up, and store it until your delivery date. DELIVERY – In most areas we offer FREE pick up & delivery. If you have a question whether or not your area is a FREE pick up & delivery area don’t hesitate to call us. 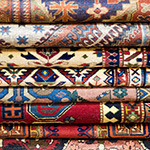 EXPERIENCE – We have decades of experience working with oriental & area rugs. SATISFACTION – We will do whatever it takes to get your rug as clean as we can. We truly want you to be satisfied with the amazing results. PET & ODOR REMOVAL –Yes, absolutely! We clean rugs that have been damaged by urine from our furry loved ones. There are some instances where the urine may have permanently damaged the rug. Your technician can answer any questions you may have on this. Call us today and let us pamper your rugs, you’ll be glad you did!